VTD = variance to date, updated weekly i.e. 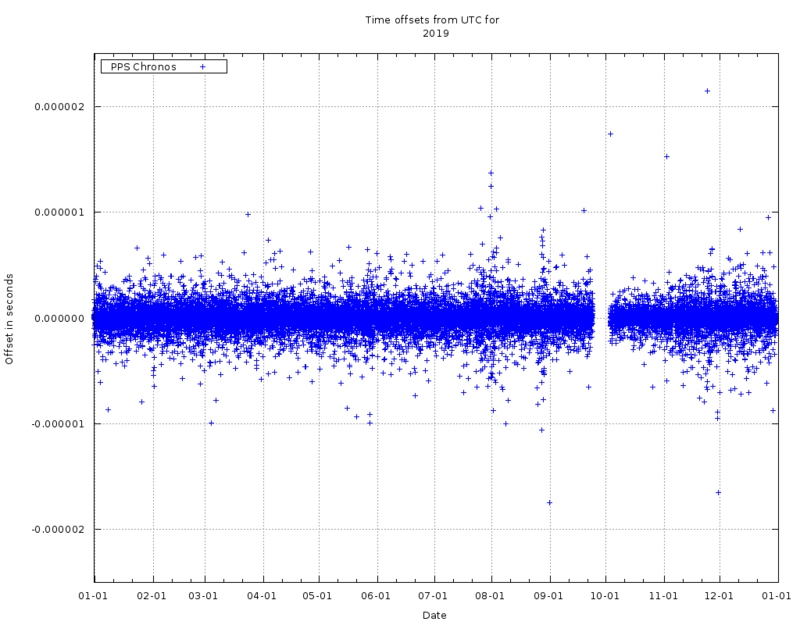 individual watch variance, in seconds from entry offset to latest posted offset. Info will generally be sorted by latest reported timekeeping by class (then alphabetically). For date of latest update please check edit data for this post, with apologies for any delays. I'll update this post with the leaderboard as and when. Obviously quartz will have a natural advantage if only insofar as it's less likely to stop or need looking after if in rotation, but I would certainly love to see mechanical challengers in the mix too! What do we reckon ? Anyone interested ? Heresy! One cannot wear one watch in all those months. But I'll attempt it with my GS Spring Drive as it's got a decent power reserve. I'm in! Will be submitting my SBGN001. It's lost 0.2s since November. How about different categories: High-accuracy quartz, quartz, mechanical? Last edited by JGJG; 29th March 2019 at 20:40. Have you compensated for height above ordnance datum? Pete, are you some sort of gee.... Never mind. For mechanicals shorten the time down to one week - this should give a good indication of accuracy. This will allow for the watch to be worn on wrist. Then one could repeat for a different watch? The GPS timing receiver does 3D location when establishing its location before giving a time signal. However, I've been to base camp on Mt Rainier, and it is quite a bit higher than I am above sea level. So, the relativistic difference between here and (what I am assuing to be) the datum would disappear in the noise. 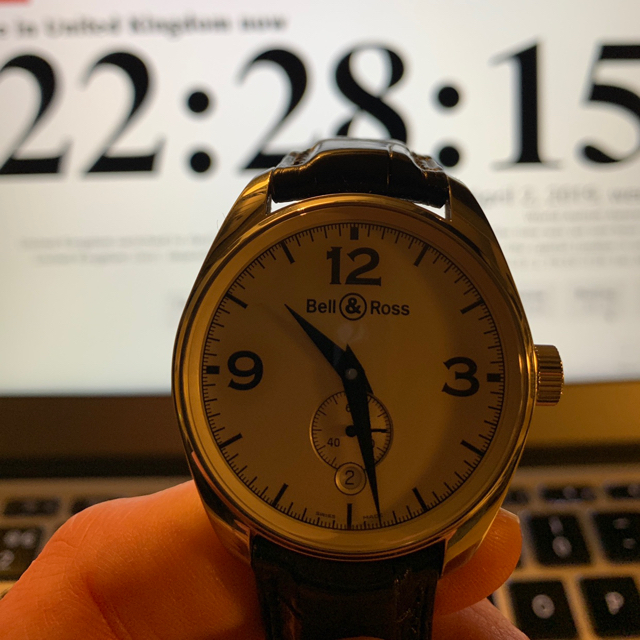 My holiday watch (yes, on holiday as of tonight, in France) has a fairly basic quartz compared to say Breitling or Omega... but it sync itself every night. I think the OP is a great idea but the above suggestion might make it a bit complex. 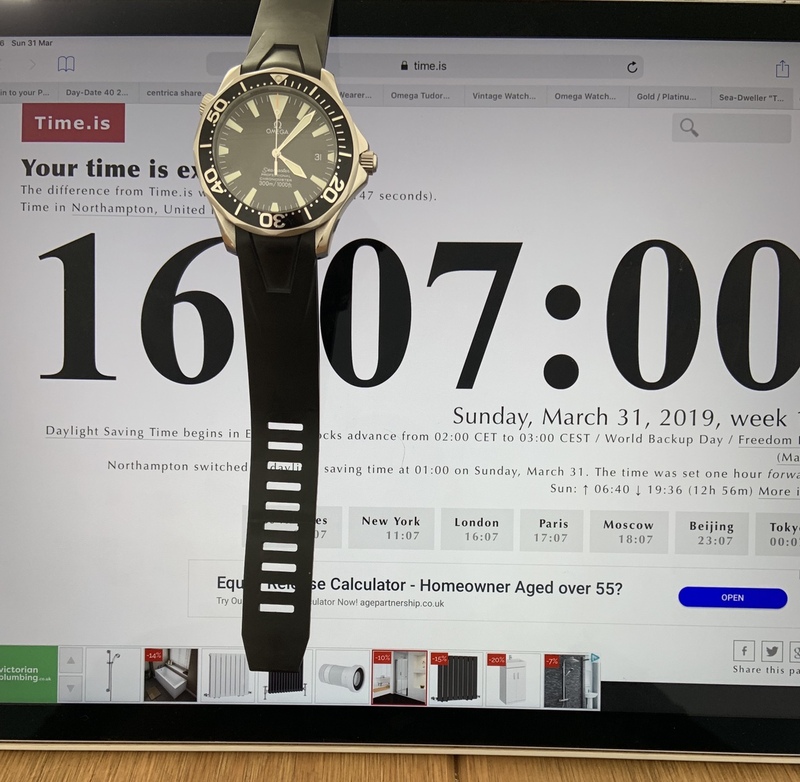 I think one watch per person would give a good indication of relative accuracy over 6 months for a variety of different watches, from different makers at different price points. Yes more than one participant may choose the same watch but that gives an indication of tolerance. 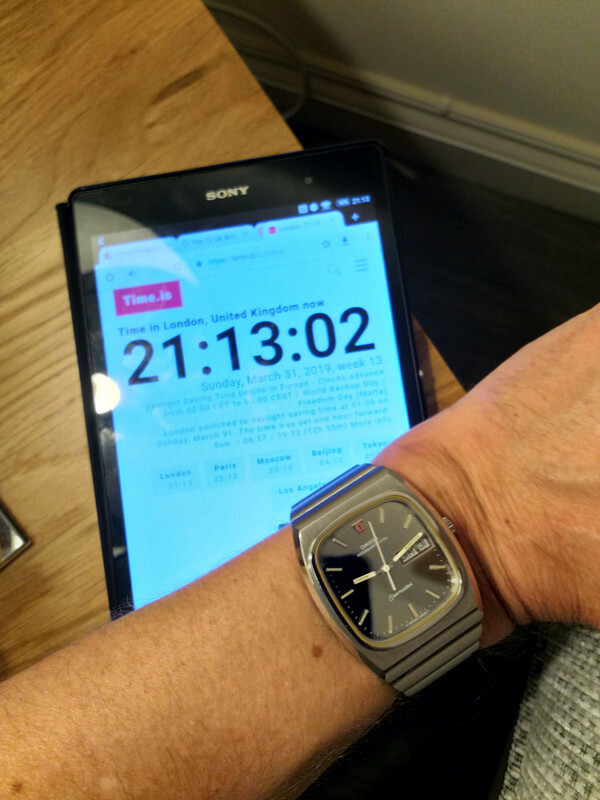 Either way it’s a great idea and I am now trying to work out which would be my most accurate watch for entry. Edit: I kind of do this already with my quartz watches so have a good idea, assuming the batteries last. Last edited by Sinnlover; 30th March 2019 at 09:49. 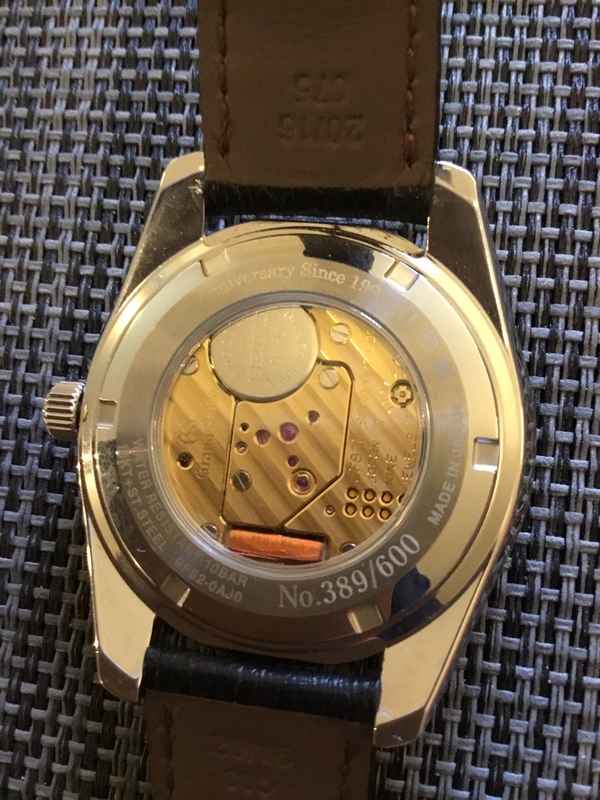 I think it will be impossible to keep any of my mechanical watches running continuously for six months - so count me out unfortunately. If I did some of mine run at -4sec/d so I’ll be 12mins behind at the end of the exercise which would not quite work. I guess I could stick it on a watch winder but doesn’t give real world measurement ? Last edited by MartynJC (UK); 30th March 2019 at 08:39. 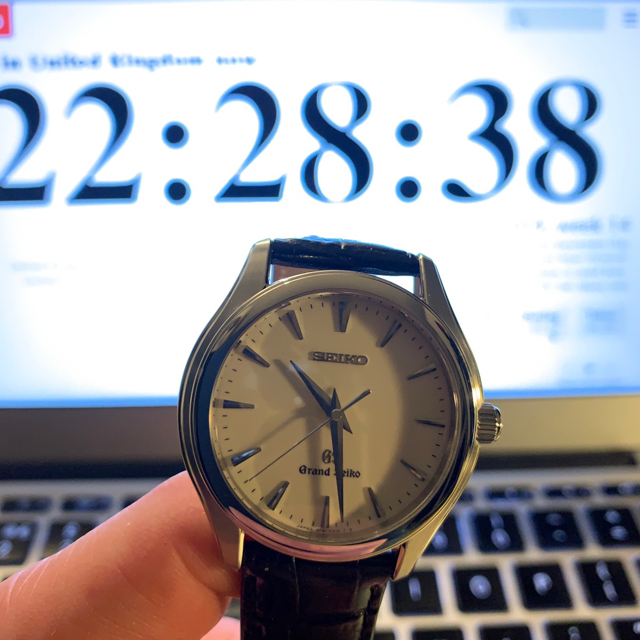 The other option is to declare your watch out when it goes, say, 1 minute off. This might make it more realistic for the mechanicals? Mick P will win this easily, none of his watches gain or lose anything at all. With the mechanicals it's going to be a test of the owner just as much as the watch - which is as it should be, as an important element of a mechanical watch is its reliance on the owner. 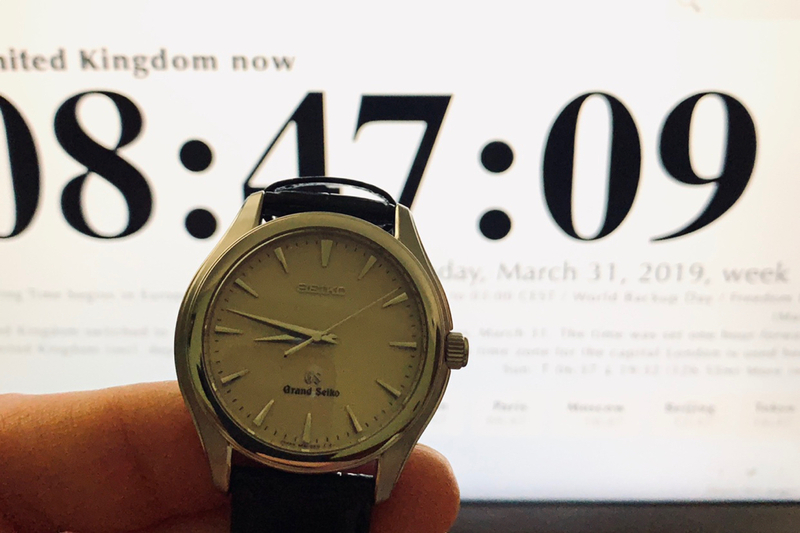 The new Citizen 0100 is guaranteed to one second per year. Can’t see how anything will beat that. Don't think anyone has one of these *yet*. I think 9F can come close even if they specify 5spy as all the ones I've owned were closer to 1spy. This one is a 5 second model; I’ve just set it for BST. At about 2-0-clock there is the little adjustment knob, so the module could presumably be tweaked to near perfection? Presumably, one of the 9F watches has a fair chance of ‘winning’....but we’l see. On the mechanical front, I’d put my money on a well-tuned Rolex. Last edited by paskinner; 30th March 2019 at 17:09. Yup, as far as I know, each step of that regulation switch adjusts by 8spy for the regular 9F. Can't find info online, but presumably the same for the super special 9F you have there Peter. 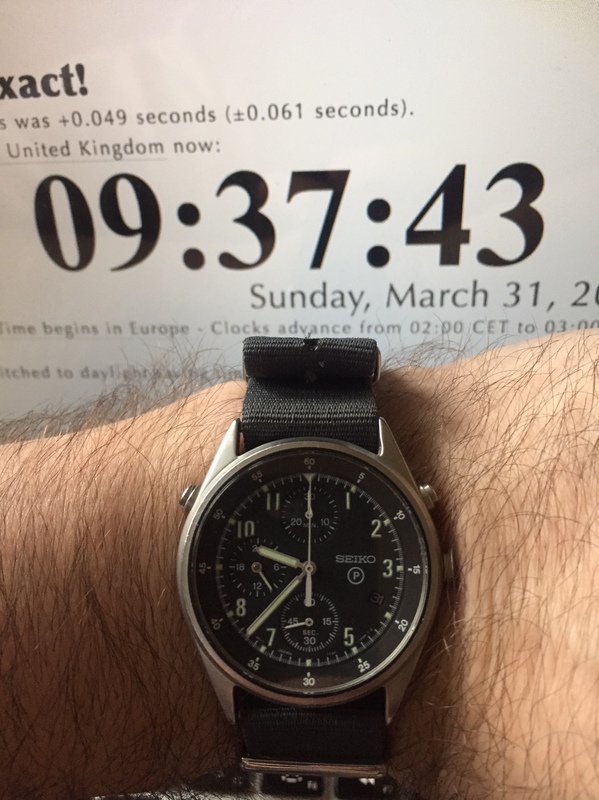 Has yours been keeping accurate time? Shamefully, I must admit that I have never checked; I trust these designs, they do what they say.....as you have also experienced. 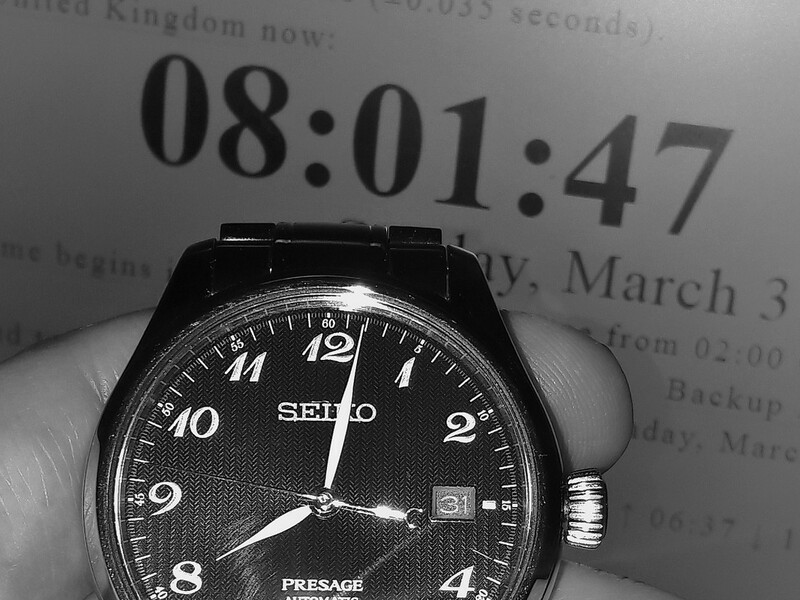 Set to time.is on my phone at 7.30am, photo to follow once I get my computer on too. When worn daily, its net accuracy is very good, so I've high hopes for this. Its PR is good enough that being left unworn for a day won't see it stopping, but will affect the accuracy. Gloomy morning -> flash photography -> horrible picture -> many apologies Here's a photo of it looking much nicer. Last edited by Der Amf; 31st March 2019 at 08:20. This a great idea for a thread but I rotate mine too often to participate officially, however I am conducting my own quartz experiment. 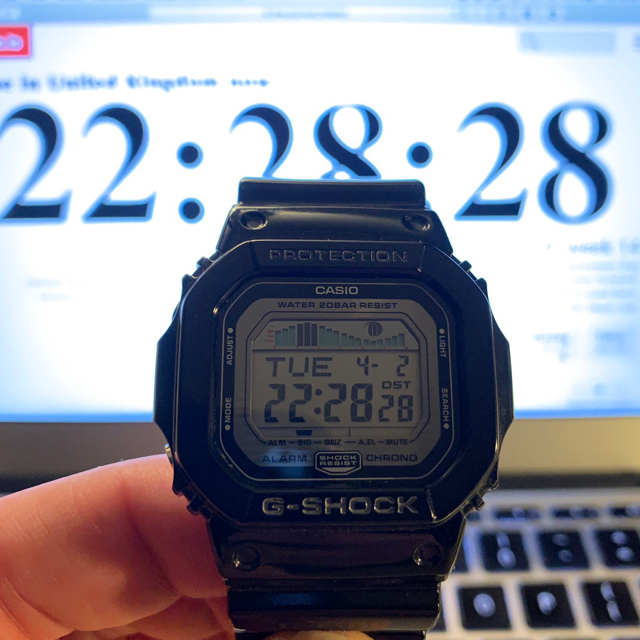 I have four non atomic G-Shocks and three analogue Citizens and I'm going to run them for a month or two and see how they behave. 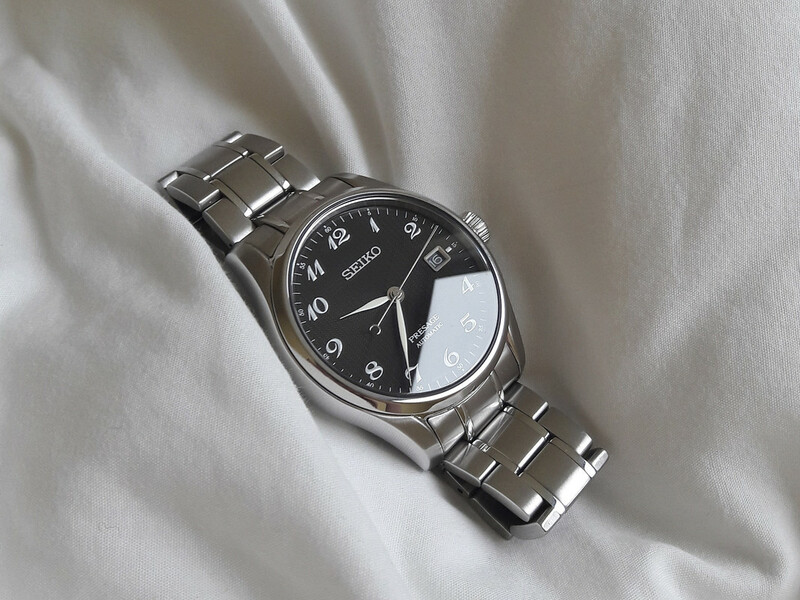 All the citizens have the same E168 movement, so variation will likely be due to temperature changes depending on time worn. On a side note, having only recently reacquired analogue quartz, can I say it's a pain to set precisely compared to digital, given the stepping motor and clutch not releasing the hand when pressed. There's obviously some human factors in there too. Good luck with everyone's experiments. 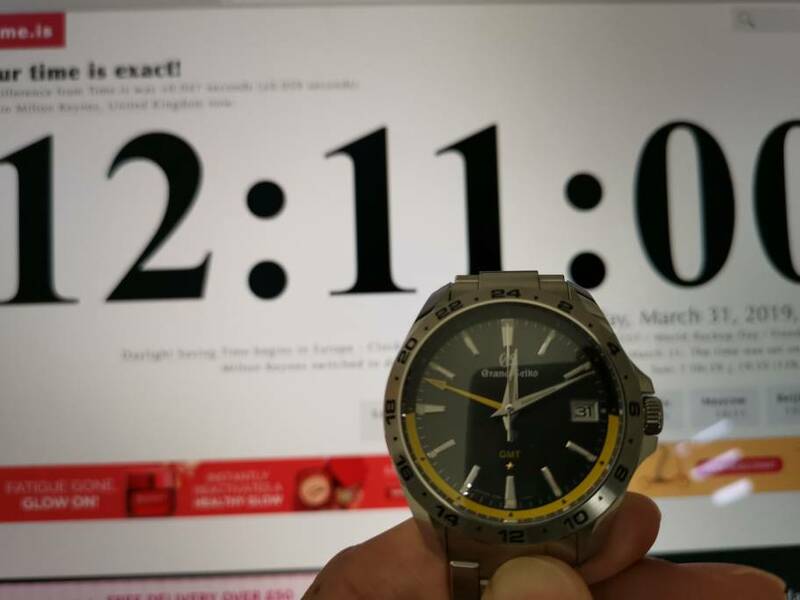 In the HAQ category, here’s my Grand Seiko SBGX009, set this morning with zero seconds offset. Last edited by JGJG; 31st March 2019 at 09:18. 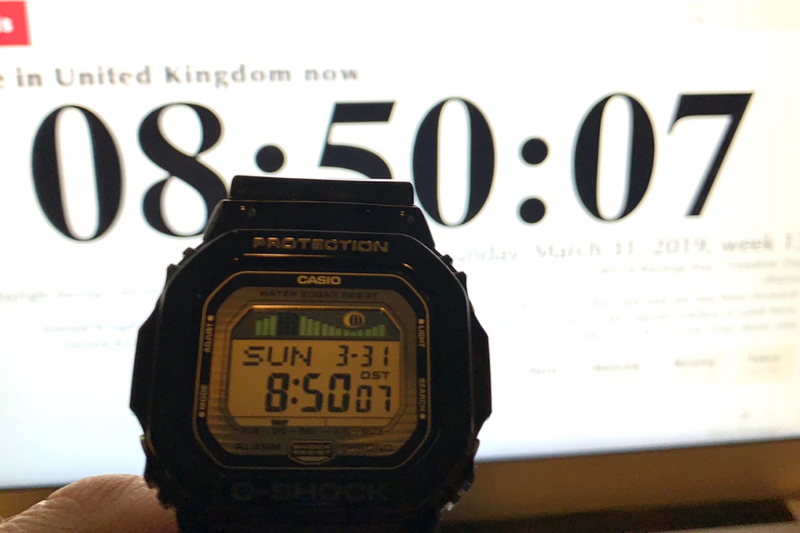 In the Quartz category, here’s my GLX 5600, set this morning with zero seconds offset. Last edited by JGJG; 31st March 2019 at 09:19. 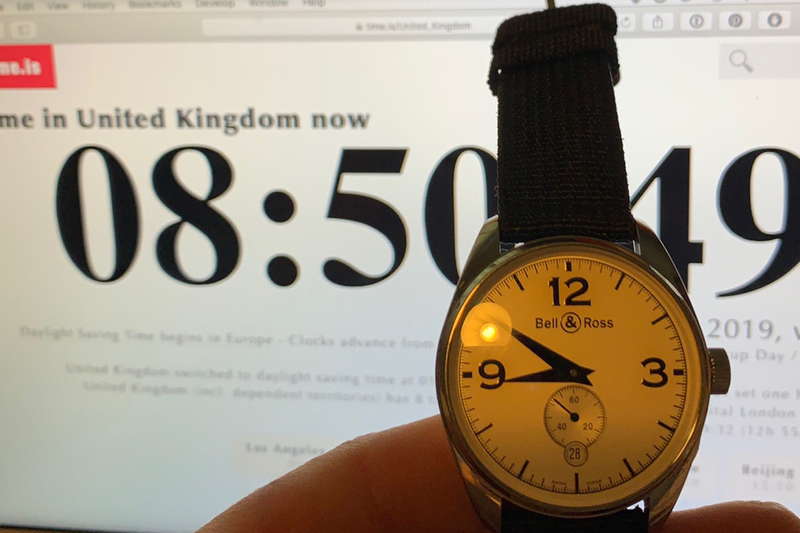 In the mechanical >£1k category, here’s my Bell & Ross 123 Geneva, set this morning with +2 seconds offset. Last edited by JGJG; 31st March 2019 at 09:20. 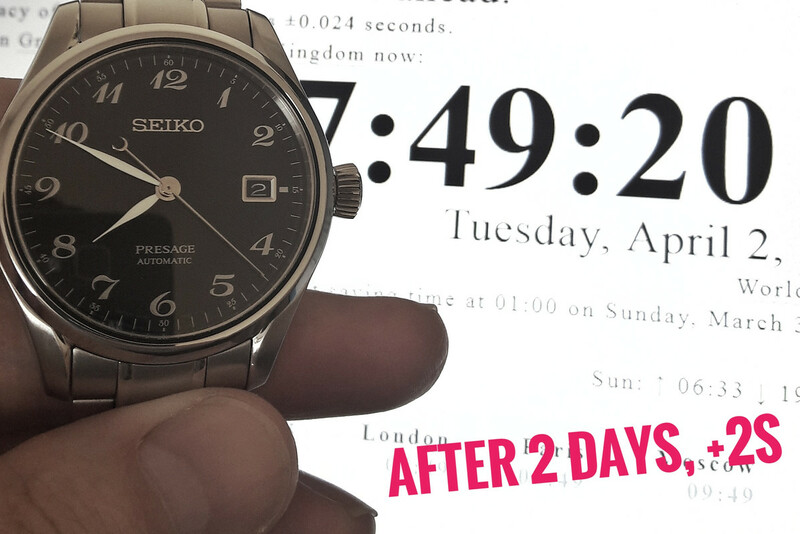 Well a sub £1000, unserviced, 26 year old, RAF issued Seiko Gen 2 for my entry. I changed the battery a few months ago so it should last the summer. Last edited by Sinnlover; 31st March 2019 at 10:06. 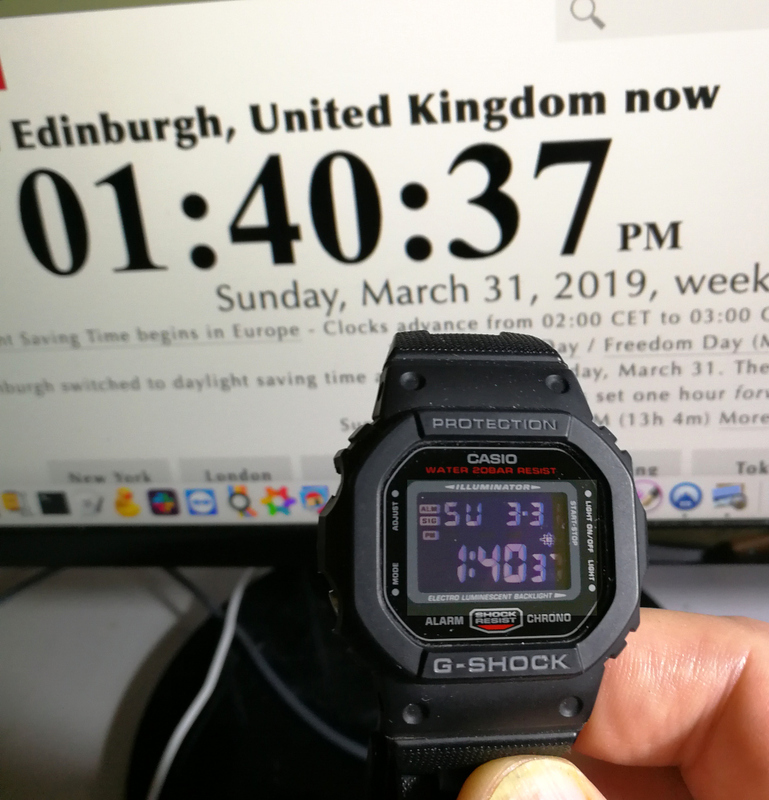 I’ll throw the 1990 CWC G10 in for this now that I have set it again today. I’ve only had it a couple of weeks so I am interested to see how it fares. Last edited by Craizeehair; 31st March 2019 at 12:20. Okay I'm in with my DW-5600-HR. It contains Casio module 3229 which is rated at ±15 seconds a month, at normal temperatures. An interesting field so far... keep em coming! 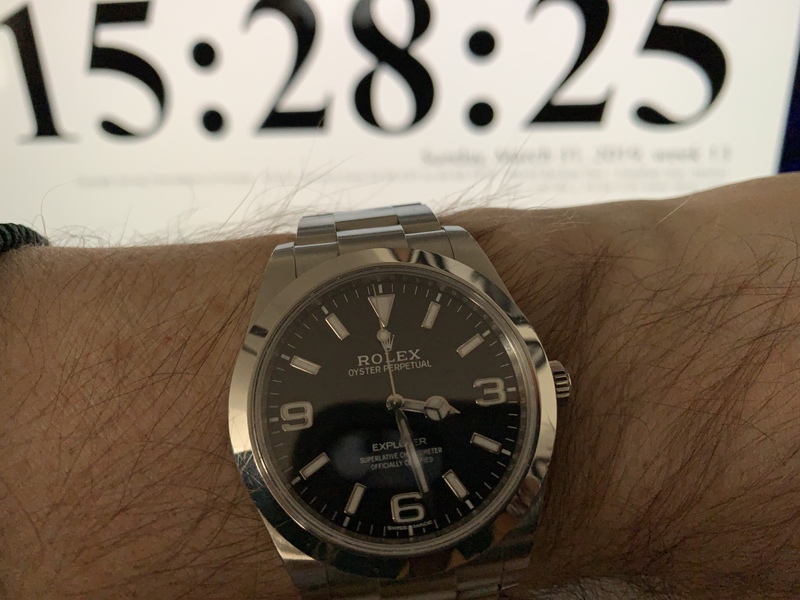 Rolex Explorer entering the mechanicals category. 25.5 seconds slow. A freshly services 70's MegaQuartz enters the fray. Will be interested to see how it does. Pop it in the HAQ category. Last edited by Tetlee; 31st March 2019 at 21:17. 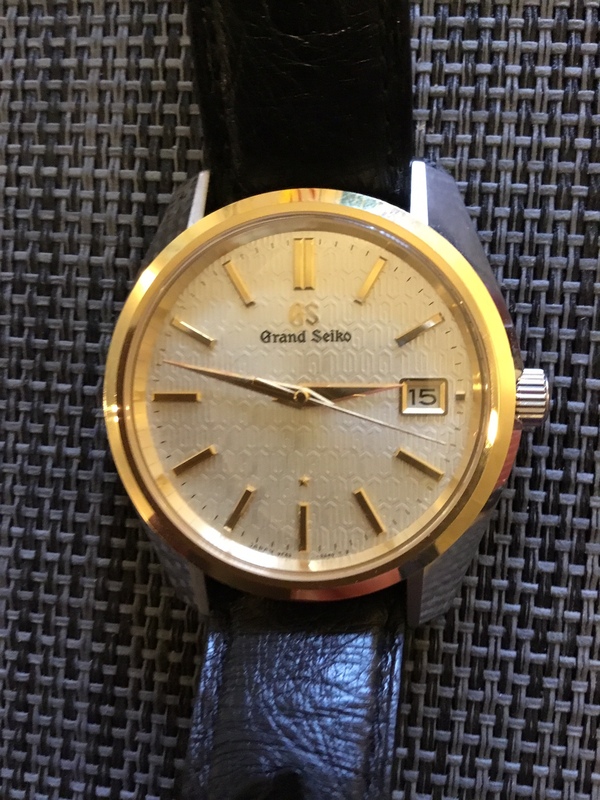 Grand Seiko SBGA041 for the spring drive category. Currently bang on. Just under 48hrs later and just nudging 0.5 seconds fast (so just under +0.25spd). At the actual 48hr mark it'll likely be bang on 0.5 fast, as it usually is. 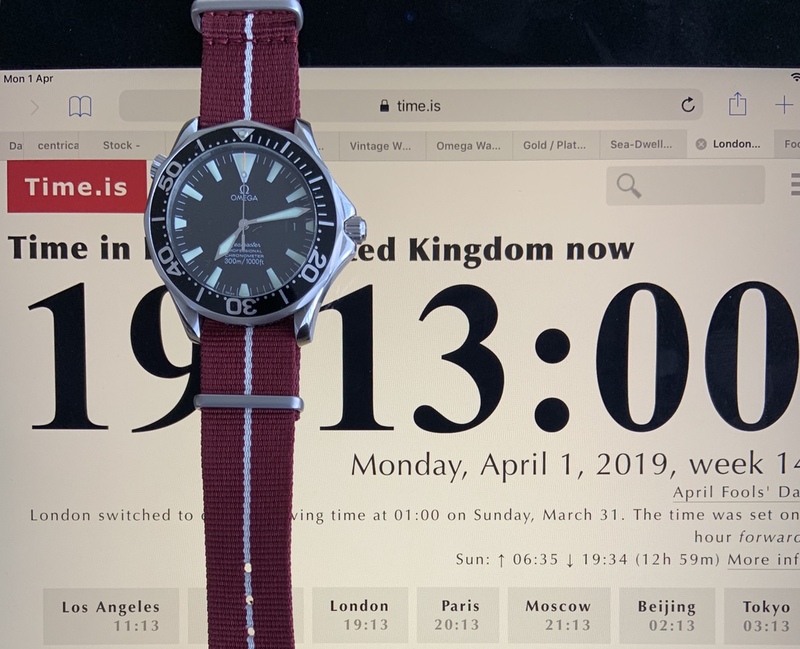 Last edited by hughtrimble; 2nd April 2019 at 12:54. It's a shame no one volunteered a two hander with no minute markers - it would be interesting seeing how long it took before the inaccuracy revealed itself. I don’t think I’ll have much chance of keeping this 2254 running for the duration but I set it yesterday and will have a good go. 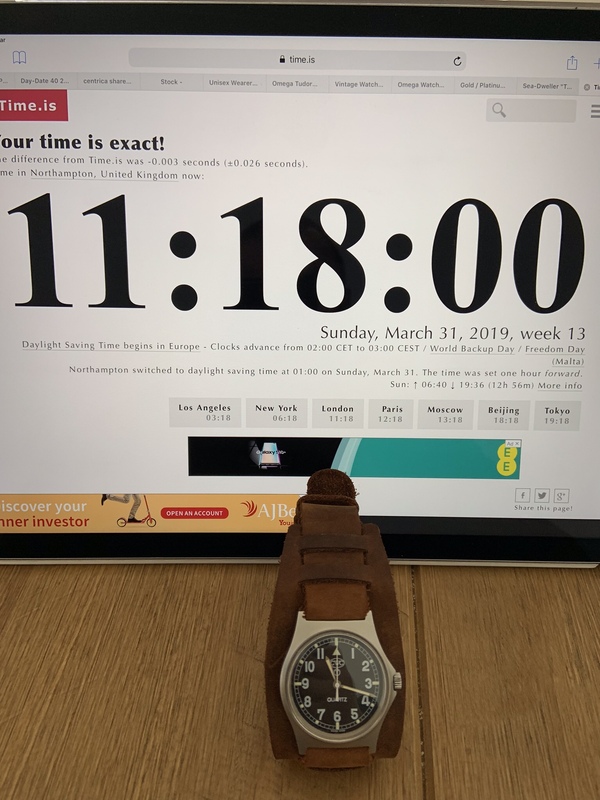 Last edited by JohnnyE; 1st April 2019 at 14:06. The Gen 2 is 0.2 seconds fast over 2 days according to Twixt. Last edited by JGJG; 2nd April 2019 at 22:41.